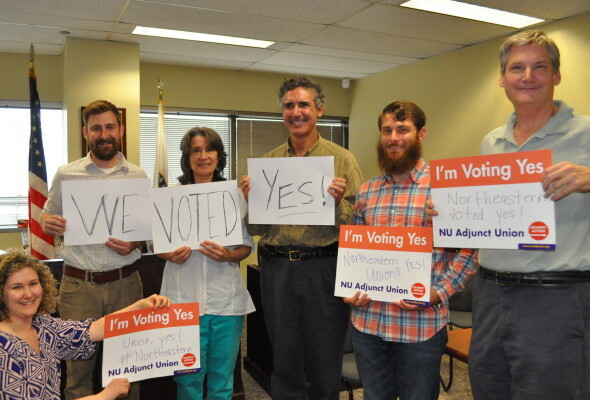 Northeastern University adjuncts organized successfully on their own behalf. There’s a great deal of discussion about the “corporatization” of the university, or about “academic capitalism,” and the infusion of market logics into higher education. Much of this literature has followed the money and –reasonably enough— emphasized the growing academic effort to capture commercially lucrative knowledge, large public grants, or tuition dollars. I myself have contributed to this literature, however modestly. But because I have also held administrative positions, I have access to at least some inside knowledge about the “corporatization” of the academy. And this more experiential form of data convinces me that the study of higher education has been somewhat one-sided, in that it has ignored important changes in budget and accounting systems within the academy (such as “resource-centered management”), or the spread of marketing and institutional “branding,” which have powerfully infused market logics into many leading American universities. Another issue that warrants much closer attention than it has received is what we might call (however inelegantly) the “adjunctification” of the professoriat. This group, composed of part-time instructors and non-tenure track faculty more generally, has been ill-served by most of our academic disciplines, which have preferred to focus on their historical “base” – the survivors of the changing academic labor market. Now, however, this base has been eroding in relative terms (and in some disciplines, even in absolute terms), and has come to account for an actual majority of the US professoriat. Academics have always been riven by hierarchies and status distinctions –the simple fact of “rank” being uppermost among them. But now a relatively new source of inequality has emerged, in the form of a sharp and apparently growing division between two distinct fractions: the stably situated professoriat on the one hand, and a newly emergent fraction we might call the academic precariat on the other. Media attention to this trend has gained force in recent years, as the press has widely reported on the appalling conditions of employment that so many adjuncts now face. Aides to U.S. Rep. George Miller, a California Democrat on the House Committee on Education and the Workforce, generated a report called the “Just-in-Time Professor” (alluding to instructors who receive course assignments at the very last minute). And the Pittsburgh Post-Gazette wrote of the sad demise of Margaret Mary Vojtko, an instructor of French who labored for 25 years as an adjunct at Duquesne University, before dying of cancer in 2013 amid near-squalid living conditions. But media and policy attention has not descended from the skies. Much of this public hand-wringing has been driven by the mobilization of adjuncts themselves, who have provided a willing and enthusiastic audience for union campaigns across the country. A leading force in this union movement has been the Service Employees International Union (SEIU), which has embraced a nine-city strategy focusing special attention on Boston, Seattle, Philadelphia, and Los Angeles. Washington DC has been a particular stronghold of this drive, with major strongholds established at such prominent institutions as Georgetown, American, and George Washington University. A majority of DC-area adjuncts are now either represented by unions or else poised to vote in NLRB elections very soon. One interesting component of SEIU’s strategy is the idea of establishing city-wide bargaining in locales like DC, where union density gathers sufficient strength. Such efforts have the potential to reshape the terms and conditions of academic employment, whether directly or indirectly. This movement, which is likely only to grow, warrants careful consideration. What prompts me to write about these events (beyond their sheer importance) is that fact that the unionization effort has spilled over into Boston, and has gained real momentum at my own university. Though our university has been trying to reduce its deployment of part-time employees (often, out of concern for US News and World Report rankings), the professional education side of our university, as well as our need to staff core writing courses, have meant that our university is in fact a major employer of adjunct labor (which is in no short supply in the Boston area). The usual issues –security, health insurance, office space, advance notice of teaching assignments, and human dignity—have surfaced, leading to very public outcries of support among students and faculty, many of whom have rallied to defend the SEIU-led campaign. Many of us felt especially compelled to act when our central administration hired Jackson Lewis, an aggressive (some would say: “notorious”) anti-union law firm to forestall the union cause. On May 15, the results were announced of the NLRB certification vote. With turnout that approximated 60 per cent of all eligible voters, supporters of SEIU affiliation outnumbered opponents by a 323-286 vote. This is one of the larger victories for the adjunct movement nationally, and builds on previous successes at Tufts University and other Boston-area campuses. Unionization surely provides a much-needed voice for adjuncts. And it will very likely improve the terms and conditions of employment for part-time faculty. But a number of questions arise at this point. What are the hopes and aspirations that members of the academic precariat hold dear? Have new PhD’s with strong degrees and publication records been displaced by rivals with even more prestigious c.v.’s, generating a downward spiral for many new Ph.D.’s, who cascade toward the bottom rungs of the academic labor market? We hear anecdotes to this effect, but we have little evidence. Other questions arise as well. Is it wise to pursue bargaining strategies that institutionalize the non-tenure track professoriat? Or is better to limit or reduce the ranks of migrant academics, e.g., by pressing universities to convert part time positions into full time lecturer or even tenure track positions? How can the academic labor market best be shaped? How will relations between those on the tenure track and the academic precariat unfold? And can the major professional associations finally respond to the needs of their contingently employed colleagues, recognizing that the contours of academia have undergone dramatic change over the last generation? Arguably, the university is the last source of relatively independent inquiry in a society convulsed with arguments over truth, reason, and verifiable “facts.” In this context, where truth claims have become ever more highly contested –think of climate change, or child rearing in gay families, or the effects of minimum wage legislation– the erosion of faculty independence becomes an urgent matter –and not merely for academics alone.